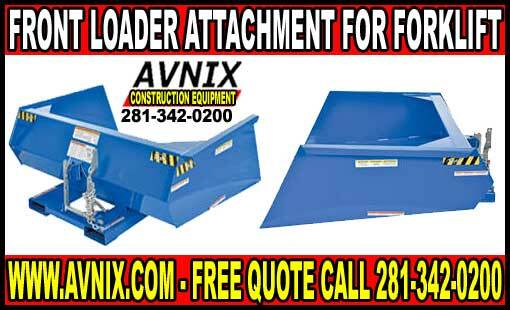 ← Heavy Duty Steel Skid Steer Bucket Attachments On Sale Now! 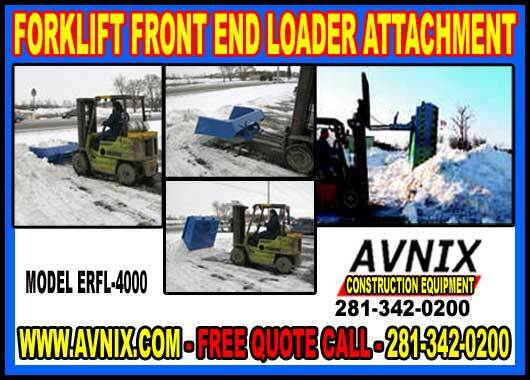 Avnix Front End Loader Forklift Attachment is designed to be used with your existing forklift truck. “Scoop Pan” design is perfect for moving snow, gravel, dirt, fertilizer, sand, rock, trash, debris or refuse. Loader scoop attachment has a pull release cable to discharge contents at dump location. Loader scoop attaches fast and simply to most forklifts. Bucket has a beveled leading edge for better scooping capability. Forklift fork pockets measure 7-5/8″W x 2-5/8″H on 24″ centers. All welded steel construction with a baked-in blue powder coat finish for a long life. Forklift Loader Attachment Operation: Drive forklift forks into fork pockets on front of loader attachment. Secure loader to fork truck mast with safety chain; Run release cable to forklift operator; Drive loader attachment into the material your wanting to move. Maneuver load to desired location. Raise forks and pull release to dump contents; Unit will return to locked upright position when set down on ground. When you think of heavy duty construction equipment forklift front end loader attachment are what usually come to mind. Forklift loader buckets are attached to the front of a fork truck with the engine on the back as a counter weight for the work to be done. Front End Forklift Loader Attachment is a type of loader attachment that is also called a bucket attachment or scoop loader because it has a wide square bucket that tilts to capture the dirt, snow, trash, debris or garbage. 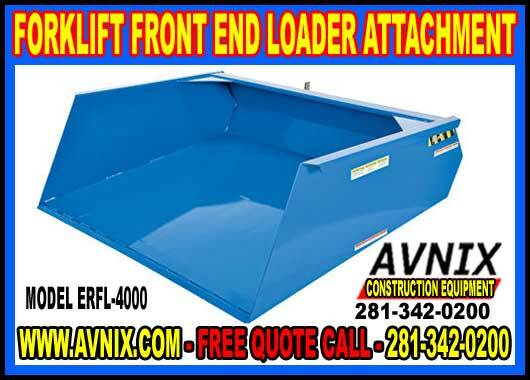 The loader bucket is a removable attachment so you can also use it as a forklift. You can also use a clamshell type of bucket that opens to grab whatever you are working on in its jaws. Forklift Loader attachments are used for the removal of snow, dirt, fertilizer, trash from farming, and construction sites.